Jeff Daehn's job title at Mayo Clinic is, as he puts it, "pretty unique." As Mayo's resident carillonneur, Daehn is only the third person to hold the position at Mayo Clinic since a carillon was installed atop the Plummer Building in 1928. The instrument is fairly distinctive itself, one of just 185 in the U.S. and Canada. Daehn brings the 56 bells, which range in size from 19 to nearly 4,000 pounds, into service by using his fists and feet to press the batons and pedals that make the bells chime. It's a physical job, and it comes with a sizeable commute. There’s no elevator from Daehn's office to the bell tower, so he hikes up the "92 or 93" stairs at least twice a day. It's a workout routine Daehn will soon need to replace. 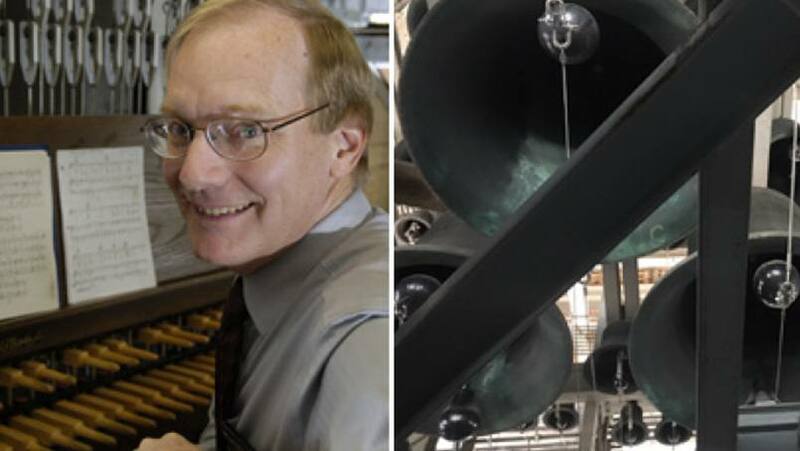 After 12 years as Mayo's carillonneur, he's retiring at the end of December. "It's not a career I planned," Daehn told us with a laugh when we called and asked him to reflect on his time in the tower. As it turns out, he'd been working as a church organist when his predecessor, Dean Robinson, encouraged him to learn to play the carillon. He began taking lessons, and when Robinson passed away in 2004, Daehn was asked to take the baton (and pedals). It was an offer he couldn't refuse, as much for the magic of the position as for the music. "The carillon is a living piece of history in Rochester," Daehn says. That history ties directly back to Mayo Clinic founders Drs. Will and Charlie Mayo, who donated the carillon's original 23 bells. James Drummond, Mayo’s first carillonneur, said his goal was to play music as a way to give "peace and inspiration and a lift of spirit to Rochester visitors, which was the intent of the carillon's donors." The carillon's final 33 bells, added in 1977, give the instrument a 4 1/2 octave range. The additional bells were the gift of the descendants of Alphonso Gooding, a 19th century Rochester business leader and friend of the Mayo family. When we asked Daehn about his favorite memories, we expected to hear about the music he's played. Instead, he told us about some of the people he's met. "Lots of interesting folks have come through for tours," he tells us. Like the woman from England who said hearing the bells made her feel like she was back in London. And the three men from Alaska who tracked him down after listening to a performance during a snowstorm. And the woman who told him how much she'd enjoyed hearing him play "Take Me Out to the Ball Game" one summer evening. He'll miss those conversations, he tells us, as well as "having the opportunity to contribute to the public mindset in subtle ways. It feels like I've been a part of history." If you're in Rochester, you can still hear Daehn perform through the end of the month. Performances are Mondays at 7 p.m., Wednesdays and Fridays at noon, and every weekday at 4:45 p.m. If you can't catch a live performance, you can watch this video or pick up a copy of a new CD, "Carillon Reflections," which features Daehn performing some of his favorite pieces. The CD is available in three Rochester locations: Mayo Clinic Gift Shop (Gonda Building, subway level), the Methodist Campus Gift Shop and the Sisters Crossing Gift Shop. Then chime in by leaving a comment below before you use the handy social media tools to share this story with others.